Is the Israelite's Exodus from Egypt a true story or is it a myth? Filmmaker Timothy Mahoney strives to answer that question while examining archaeological and historical evidence in his new documentary "Patterns of Evidence: Exodus". This documentary took Timothy Mahoney 12 years to make and involved his traveling from Israel to Egypt to the Netherlands. "Patterns of Evidence: Exodus" examines Biblical texts and archaeological artifacts and contains interviews with leading experts -- both those who are for and against the authenticity of the Bible's Exodus. It was interesting to see the historical timeline presented visually in this documentary. 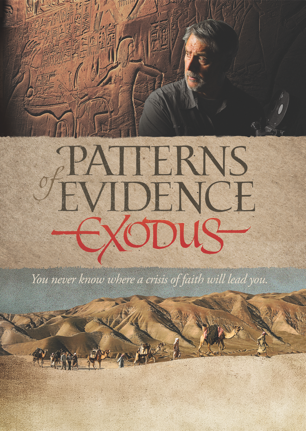 "Patterns of Evidence: Exodus" considers that the artifacts that prove the Biblical account to be true may be "missing" because people have been looking for the Exodus at the wrong time in history. Shifting the timeline back 250 - 400 years means that events in the Bible, including the Exodus, begin to line up with archaeological and historical evidence. Is it enough to consider the Exodus to be a moral fable or does it matter to you if the Exodus story is true? "Patterns of Evidence: Exodus" is a great documentary for those that question the validity of the Scriptures and for those who want to critically think about what they believe. My husband, 9 year old and 11 year old were intrigued by this documentary (though admittedly my kids only watched the first half hour). I trust that you and your family will enjoy it and be challenged by it too. Win it: One Sowing Dandelion Seeds reader will win a copy of the DVD "Patterns of Evidence: Exodus". Hi Joseph, I hope you get the chance to see this movie (even if you don't win!). I love reading about King Salmon ( his legal decisions are great) and the psalms. Trying to narrow it down to one is difficult! :) I love the stories of God's deliverance of His people: Moses, Esther, David, Jonah, Daniel; and I love the Psalms and the book of Isaiah. I like the story of Joseph...just when things seem to be really bad, God had a plan!! Proverbs 3:5-6 is my favorite. I'm actually not all that familiar with it, but I'd love to see this film! I'm a long time now and then follower of Sowing Dandelion Seeds, so this is not a criticism...but I just want you to be informed. A lot of Biblical scholars have serious issues with this movie. Gale, I'd probably have to read the article and watch the movie each a few more times to get a better grasp of the views... But, I still think the movie is good for promoting discussion and critical thinking -- whether you agree with the documentary's point of view or not. I'll have to look into it further myself -- thanks for the heads up! The story of Abraham. It shows gods true might. He lost so much. I think that my favorite Old Testament story is that of Joseph. The way that God protected him and brought him to power is amazing. Thank you for the giveaway! I love the story of Joseph too. It reminds me of the verse "All things work together for good to them that love God, to them who are the called according to His purpose." My favorite verse about faith is probably 1 Peter 1:7-- These have come so that your faith-- of greater worth than gold, which perishes even though refined by fire- may be proved genuine and may result in praise, glory, and honor when Jesus Christ is revealed. I liked reading about Moses. The stories of Moses are amazing! The Book of Numbers has some great stories ... the twelve scouts ... Joshua & Caleb stand out. The story of Joshua and Caleb is amazing -- it's such a great example of standing up for what you believe!